This week's five AHAs are from the AHAbook™ BEing Seen and BEing Heard as a Thought Leader. 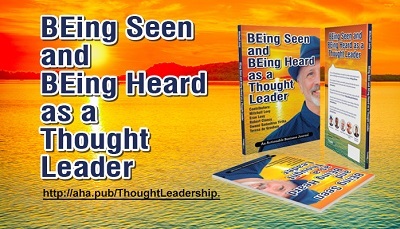 Please share this URL "aha.pub/ThoughtLeadership" in your social media status update to let your friends know about it. To see and learn how to automatically share AHAmessages from this book, you may check out this video: https://youtu.be/h_3qFIqFcJU. To learn how to automatically share via AHAblaster, please watch: https://youtu.be/_YbEP4xhjYY.